Happy February! We had 20 below yesterday morning so I think the groundhog just stayed wrapped up in his quilt and stayed in bed. I know that's what I wanted to do! I also know that we still have a lot of winter left whether he saw a shadow or not. We do however gain 2 1/2 minutes of daylight each day in February. That means about 1 hour and 10 minutes more of daylight by the end of the month!!! That makes my heart happy. I do have to say I had high hopes on catching up on a few things in January including organizing my sewing room but I've only managed to start a new project. I finally got my patterns, the wool ordered, and backgrounds picked for our new Woodland Whimsy BOM. It is all want to work on now. Funny how everything else just went by the wayside. Next year I'll get caught up and organized! We still have 1 double room available for our March 23-26 retreat. If anyone is interested please call the store as soon as possible and reserve your spot! The cost of the retreat is $275 with a $100 deposit. Join us in the classroom and bring your hand work along. 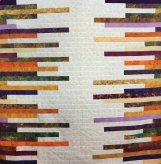 It might be a great way to get that quilt bound without any distractions! If you can't make it to class, we still have a few kits and we can add you to our mail order list. Contact the store for more information. 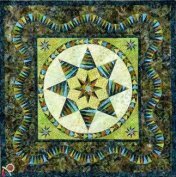 This is an open group for anyone who wants to learn Toni's method of foundation piecing using pattern ease. She has printed foundations for a variety of patterns. You must purchase each pattern and an additional charge for her printed foundations is separate. 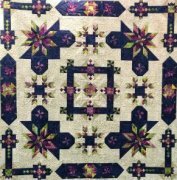 Magic Forest by Jacqueline de Jonge is just one of beautiful quilts she uses her foundation piecing method with. Note: Toni will not be having class on the last Tuesday this month. Finally! We have our our materials to start on these adorable blocks! This is a 12 month program. There are 10 critter blocks. 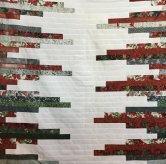 You choose 9 blocks to use in the quilt and one is a bonus block that you can use a pillow if you want. 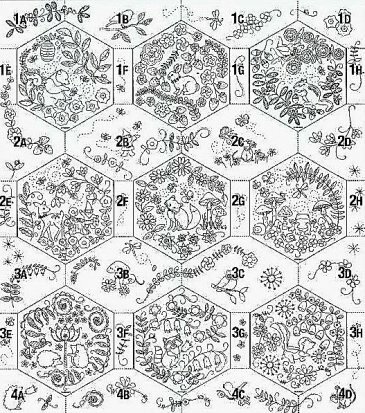 The last 2 months are adding appliques to the borders. It will be $22.50 each month. We will offer a thread kit for $21.50 a month for 10 months. They will include the following specialty embroidery threads: Sue Spargo's Eleganza pearl cotton in sizes 8, 5, and 3 and The Thread Gatherer's Silken Pearl SP3 and SP10 and Silken Chenille. Amy uses these threads to embellish her designs. Of coarse you can use any threads or floss you have but you might enjoy working with these beautiful threads if you have not had a chance to yet! Amy also uses stitches from the book The Right-Handed Embroiderer's Companion (there is also a left-handed version) by Yvette Stanton. We sell the book for $28.00. We also have Creative Stitching by Sue Spargo for $32.00. Both of these are helpful guides for stitches used in these blocks. This is a line drawing of the of the finished quilt. She doesn't have a color photo as of yet. Finished size approximately 54 x 60.
and touches the ground so it is now a column. 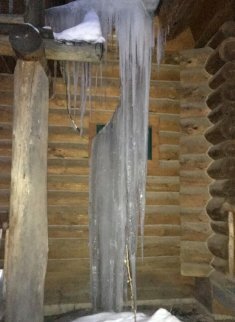 It has been a very cold winter so far!! !